Our worship today began with a special Thanksgiving for Baptism – something I don’t think we give much thought to in our daily run through life. And the title of today’s sermon may be the most frequent question I ask people. If it’s not at the top of the list it’s pretty close to the top.When I ask the question, “do you remember your baptism?” to confirmation aged students, 99.9% of the time the response is “No. Are you kidding me, I was just a baby. Of course I don’t remember it”. As Lutheran Christians we lift up the Sacrament of Holy Baptism as one of the most central and significant experiences in our life of faith. So why does it seem like so many of us have no interest in actually living our lives in ways that reveal our identity as baptized children of God. We’ve already moved on to another identity even before the water has evaporated from our forehead with no real interest in actually living life as a baptized child of God. There was a business man walking by a fishing pier on his way to yet another meeting when he noticed that his neighbor who was a professional fisherman had already docked his boat for the day on the pier and was wasting valuable fishing and money making time playing catch with a young boy from their neighborhood. “Why aren’t you out fishing?” asked the businessman. “Because I caught enough fish for one day,” replied the fisherman. Are you enjoying life as a child of God, a baptized son or daughter in the body of Christ? Do you remember your baptism? Or is your baptism a onetime event that you can’t remember because you were just a baby and you don’t think it has any significance or importance in your life today. Or is your baptism significant for you because you think you now have a get out of hell free ticket or some extra fire insurance from God just in case you really screw something up in your life. Or do hear voices around you tell you that your baptism as an infant didn’t really count because you weren’t the one making the decision to have Jesus in your life. The baptism of Jesus that we celebrate this weekend is an invitation for all of us to remember our own baptisms – not as something that happened in the past, but as something that is important to every day of our life in Christ. The story of the baptism of Jesus appears in all four gospels, but I want you to note the differences in Luke’s gospel. Luke doesn’t seem too concerned with the actual moment of the baptism. Luke is more interested in what happens after the baptism. Interested in telling us the story of a savior named Jesus who remembers his baptism long after the event of the baptism has taken place. And take note of who baptizes Jesus in this gospel. It’s not John the Baptist. By the time Jesus is baptized in Luke’s gospel, John has already been thrown in jail by King Herod. This encounter at the river in Luke is nothing less than a divine moment between God and Jesus Christ through the power and presence of the Holy Spirit. 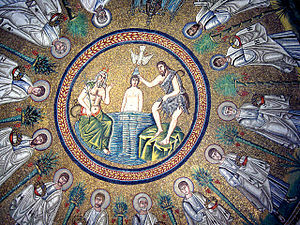 Jesus is baptized by the Holy Spirit. And you know what, it’s the same Holy Spirit that you and I are sealed with in our baptism. And the question I ask today as we seek to follow Christ’s path is, do you remember your baptism? As Jesus remembered his baptism he cared for the sick and those who had been thrown out of the community. He fed the hungry and helped the poor experience the riches of his love. As Jesus remembered his baptism he died on a cross for you and me. And you know what, it’s that cross you and I are marked with in our baptism. Brothers and sisters in Christ, remember your baptism in emails and text messages that you send and in every conversation that you have. May they carry words filled with the peace and love that God has for all children of God. Remember your baptism as you care for friends and family and neighbors in need. May your care help them experience the gentle touch of Jesus’ healing hand. Remember your baptism as you take time each day to pray. And in these times of prayer, may you hear God speaking directly to you, calling you his beloved son. His beloved daughter. In my own life in Christ I say similar words. As I make the sign of the cross. I say “I am a child of God. Marked with the cross of Christ and sealed with the Holy Spirit forever. Amen.” No, as a matter of fact, the ritual of making the sign of the cross is not reserved only for our Roman Catholic brothers and sisters, it’s for Lutherans too. And whether you do it with a small cross on your forehead or a large cross over your entire body, it’s a great way to remember your baptism. Do you remember you baptism? This entry was posted on Monday, January 14th, 2013 at 1:31 am	and posted in Recent Sermons. You can follow any responses to this entry through the RSS 2.0 feed. I was home ill this weekend from Friday until Sunday…..Much better today(Monday). Yes! I do remember by Baptism December 7th, 1941…Verona North Dakota. My God Mother is still living and a very much part of my life. My God Father died in the war. I felt so bad I could not be in church on Sunday as I knew you would probably preach on baptism….my favorite subject. Take care!! Julie is back in Bismarck…living with us until she finds her own digs. She will be a NICU Nurse at St.A’s. She starts on Tuesday. Thanks Bev. I look forward to seeing Julie again. Thanks Craig for a beautiful message. This is a great reminder to me, to remember to live for God as He intended for us.